← 5 Reasons to go see #Cinderella, in theaters now! 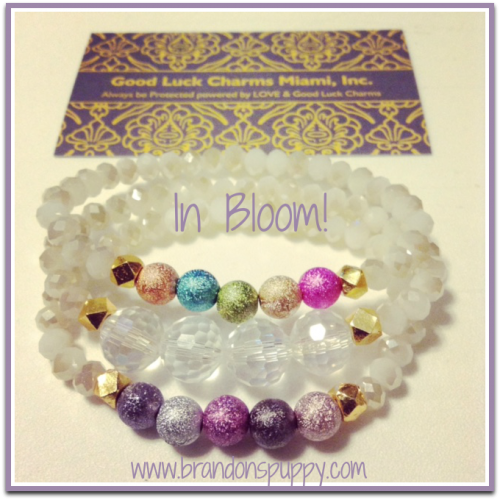 Good Luck Charms Miami Spring Giveaway! Today is the first day of Spring, and In Bloom by Good Luck Charms Miami is the perfect accessory to wear during the season! This gorgeous set of (3) is adorned with Almond Vanilla Accent Swarovski Crystals and Embellished with Spring Pastels and Metallic Metals, Stardust Beads and Facetted Crystal and Gold Bicone Accents. Its the perfect set for Spring Love! GIVEAWAY: One lucky Brandon’s Puppy reader will win the gorgeous three piece set pictured above from Good Luck Charms Miami. Just fill out the required entries on the rafflecopter form below. (For first time visitors, one of the entries is a comment on this post. Please scroll to the end of the post and “leave a reply”.) Winner will be announced on Friday, March 27th. Good luck! This entry was posted in Fun Stuff, Giveaways. Bookmark the permalink. 9 Responses to Good Luck Charms Miami Spring Giveaway! Very nice hope to win. I want rock new Spring accessories and these darling bracelets will be my BIG do. My favorite thing about spring is wearing rain boots and splashing around in the puddles! I love the scenery, smells, and weather in the spring!